SAVE THE DATE for the Taste of Larchmont tailgate party. 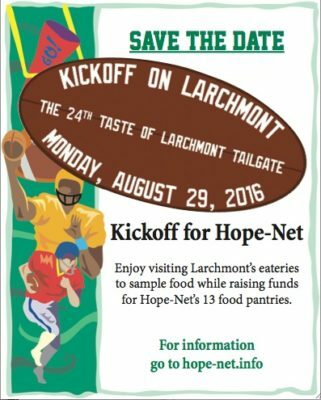 Hope-Net kicks off a new year of feeding people in need at the 24th Taste of Larchmont Tailgate party, Mon., Aug. 29 from 6 to 9 p.m. This year’s event celebrates football, especially the return of the Rams and the all-American pastime of pre-game partying in a parking lot. Restaurants on the boulevard will serve samples of their cuisine to ticketholders, known as passport holders. The event raises money that will stock the shelves of 13 area food pantries. Passports can be purchased for $40. Raffle tickets are $5 each or four for $20. For more information or to volunteer, call 213-389-9949, or go to hope-net.info.